Provo and Orem Personal Trainer | Your Fitness Quest: The Paleo Diet: So easy a caveman can do it. The Paleolithic, or caveman, diet follows the premise that we should eat like our early ancestors and that our bodies are not equipped to process foods that didn't exist thousands of years ago. It follows the hunter gatherer mentality that you should "graze" and work for your food as opposed to domesticating animals and raising grain for your diet. I can see the wisdom in eating more "live" and unprocessed foods, but I don't completely buy the idea that dairy and grain are bad for us. It's true that many people gain a lot of weight from eating too many carbs (bread and cereal), but I also believe bread is the staff of life. As with any diet, there are pros and cons and advocates and critics to this style of eating. I don't view domesticating animals and raising grain as bad things, but rather as progress; however, when you see some of the conditions that cows, pigs, and chickens are raised in, it is obvious that finding food sources in the wild would be advantageous as opposed to eating an animal raised in a cage that has been pumped full of hormones to make it grow faster. This topic also reminds me that we should adopt a Paleo activity level to help offset our sedentary lifestyles. I believe many of the principles of a Paleo diet can be beneficial as long as you don't get too extreme. Remember, if you really want to hold true to the diet of ancient ancestors, then you should probably not refrigerate your meat or brush your teeth after eating either. 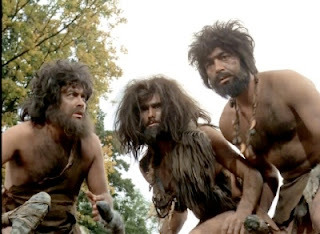 This video is not relevant to nutrition, but since we are talking cavemen, I have to include one of my favorite commercials. I agree Paleo is a good way to be but with today's availability of foods and our knowledge we can make reasonable exceptions with grains and dairy without compromising our health. That's a great commercial. I'll have to look into eating Paleo. Very cool post! I would advise the Paleo method of training rather than the Paleo diet. Those guys worked their asses off for food. We need to have the same mindset. It's easy to do as long as you have proper nutrition. Thanks for that information.